The Arena hungers. And here you are, brave Gladiator, walking into its maw. With your weapons in hand and your wits about you, you know you'll succeed where so many others have failed. You'll make it out. You have to believe you'll make it out. There Is No Way Out Of This Arena is a tabletop role-playing game by C. Leary about gladiatorial combat and the inevitability of death. 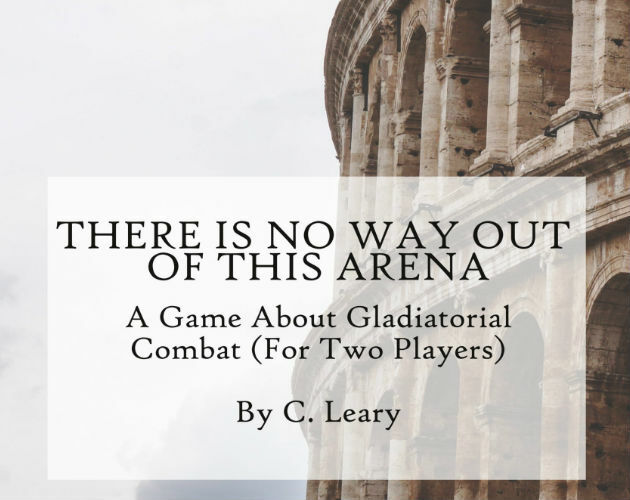 It's lightweight, designed for two core players (and an optional third), and is easy to adapt to any setting in which one party would march inexorably towards their own doom. Absolutely incredible game. Loved playing it, great, simple rules. Elegant and captivating.